The organs of the hepatosplanchnic system are considered to play a key role in the development of multiorgan failure during septic shock. Impaired oxygenation of the intestinal mucosa can lead to disruption of the intestinal barrier, which may promote a vicious cycle of inflammatory response, increased oxygen demand and inadequate oxygen supply. Standard septic shock therapy includes supportive treatment such as fluid resuscitation, administration of vasopressors (adrenergic and nonadrenergic drugs), and respiratory and renal support. These therapies may have beneficial or detrimental effects not only on systemic haemodynamics but also on splanchnic haemodynamics, at both the macrocirculatory and microcirculatory levels. This clinical review focuses on the splanchnic haemodynamic and metabolic effects of standard therapies used in patients with septic shock, as well as on the recently described nonconventional therapies such as vasopressin, prostacyclin and N-acetyl cysteine. Research interest has focused on the intestinal and hepatic circulations in various models of shock, and particularly in septic shock. The splanchnic area is reported to be the 'motor' of multiple organ failure  and the 'canary' of the body . In fact, because of its peculiar vascular anatomy, the hepatosplanchnic area is jeopardized during septic shock, which may potentially lead to a vicious circle of inflammatory responses, culminating in multiple organ failure syndrome. The present clinical review briefly discusses the splanchnic vascular anatomy and focuses on the different therapeutic approaches that have been proposed to promote perfusion of the gastrointestinal tract during resuscitation of patients with septic shock. When possible and reasonable, we propose therapeutic recommendations. References were obtained from Medline database (from the earliest records to 2003). We used the following keywords: gastric mucosal pH or pHi, splanchnic, haemodynamics, microcirculation, sepsis, septic shock, vasoactive drugs, dobutamine, dopamine, norepinephrine, epinephrine, dopexamine vasopressin, terlipressin, prostacyclin, N-acetyl cysteine, dialysis and haemofiltration. We also reviewed the reference lists of all available review articles and primary studies to identify references not found in computerized searches. We placed emphasis on prospective, randomized, controlled clinical trials. The splanchnic vasculature includes both serial and parallel vascular beds (Fig. 1). The gut is perfused by the coeliac trunk and mesenteric arteries, and is drained via the portal system. The liver has a unique and special blood supply that includes both arterial (the common hepatic artery) and venous (the portal vein) inflow. The portal vein supplies 75–80% of the liver blood flow and the hepatic artery supplies 20–25%. Physiologically, there is an interdependent response with a compensatory blood flow between the portal vein and the hepatic artery called the hepatic arterial buffer response . The hepatosplanchnic blood flow accounts for 25–30% of the cardiac output , and the regional oxygen extraction is slightly higher than the whole body oxygen extraction. During sepsis or septic shock, splanchnic oxygen extraction is increased compared with nonseptic patients (44% versus 30%), which leads to an increase in the hepatic venous/mixed venous haemoglobin oxygen saturation gradient . In clinical practice it is generally not possible to determine portal venous flow in isolation, and measurements are taken from the hepatosplanchnic region as a whole. The flow is estimated at bedside by the method of primed, constant infusion of indocyanine green (ICG) with hepatic venous catheterization . Splanchnic anatomy and flows in healthy volunteers. The intestinal villus is supplied by a single, unbranched arterial vessel that arborizes at the villus tip into a network of surface capillaries drained by a central villus vein. This anatomical arrangement allows countercurrent exchange and shunting of diffusible molecules such as oxygen, and hypoxia may occur at the tip of the villus even during moderate decreases in macrocirculatory flow . In addition, intestinal villi perfusion is highly heterogeneous, as suggested by the wide range of intestinal surface oxygen saturation . In patients with sepsis, splanchnic blood flow usually increases in proportion to cardiac output  and is associated with decreased hepatic vein oxygen haemoglobin saturation. Two different interpretations are possible: first, the increase in splanchnic blood flow is insufficient to meet the increased oxygen consumption; and second, hepatic arterial blood flow is reduced as a consequence of the hepatic arterial buffer response. The latter hypothesis is supported by the observations of De Backer and coworkers , who demonstrated that there is usually no net lactate production from the hepatosplanchnic area. In addition, the observation that splanchnic blood flow is increased does not rule out an impairment in microvascular blood flow [10–12] or the presence of cytopathic hypoxia . In normal conditions the partial carbon dioxide tension (PCO2) gap, which is defined as the difference between mucosal PCO2 measured with a tonometer and arterial PCO2, is low. In case of inadequate mucosal blood flow, whether tissue hypoxia is present or not, the PCO2 gap increases. Levy and coworkers  recently reported that a PCO2 gap greater than 20 mmHg was associated with poor outcome in patients with septic shock. Unfortunately, there is no apparent correlation between PCO2 gap and global or regional haemodynamic measurements in septic patients  because the PCO2 gap mirrors both variations in microvascular flow  and in carbon dioxide metabolism . For these reasons variations in PCO2 gap must be interpreted with caution. The mainstay of supportive treatment in patients with severe sepsis or septic shock is maintenance of adequate fluid balance, titration of appropriate oxygen delivery, and adequate perfusion pressure . Hypovolaemia is a common clinical occurrence in intensive care medicine and results from several mechanisms such as fluid loss, haemorrhage, vasoplegia and capillary leak syndrome. This explains why fluid replacement therapy is a key component in the treatment of severe sepsis and septic shock. Although there is no consensus regarding the ideal type of fluid replacement, colloids are efficient in this indication . There are few clinical studies focusing on the effects of colloids on splanchnic haemodynamics. In a randomized study conducted in patients with sepsis, Boldt and coworkers  assessed the effects on tonometric gastric mucosal acidosis of hydroxyethyl starch and albumin targeted to maintain pulmonary artery occlusion pressure between 12 and 18 mmHg. In hydroxyethyl starch treated patients cardiac index, oxygen delivery and consumption increased, and gastric intramucosal pH (pHi) remained stable whereas it decreased in albumin treated patients. In three other studies [20–22] conducted in patients with sepsis and septic shock, fluid challenges performed with hydroxyethyl starch neither altered the PCO2 gap nor influenced splanchnic haemodynamics. Moreover, a randomized comparison of hydroxyethyl starch and gelatin in haemodynamically stable septic patients revealed a beneficial effect of gelatin on the PCO2 gap . These studies suggested no better effect of one colloid over the others on splanchnic haemodynamics, and the use of colloids must be weighed against their side effects . Red blood cell transfusions are commonly used in intensive care units (ICUs) to enhance systemic oxygen delivery. However, proof of improved utilization of oxygen by peripheral tissues, especially in the splanchnic area, is lacking. Silverman and Tuma  reported the absence of improved gastric pHi with red blood cell transfusions in 21 septic patients. Moreover, there is an inverse association between the change in gastric pHi and the age of the transfused blood . Finally, a recent report in 15 septic patients showed that red blood cell transfusion failed to improve oxygen utilization measured either using Fick's equation or by indirect calorimetry, and gastric pHi remained unaltered . The choice of vasoactive drugs in sepsis and septic shock is controversial. There is no evidence that any one vasoactive drug is more effective or safer than any other. Larger trials are needed to elucidate existing clinically significant differences in morbidity and mortality. A multicentre trial, which is currently ongoing, is comparing the effects of epinephrine with a combination of a fixed dose of dobutamine in addition to norepinephrine. 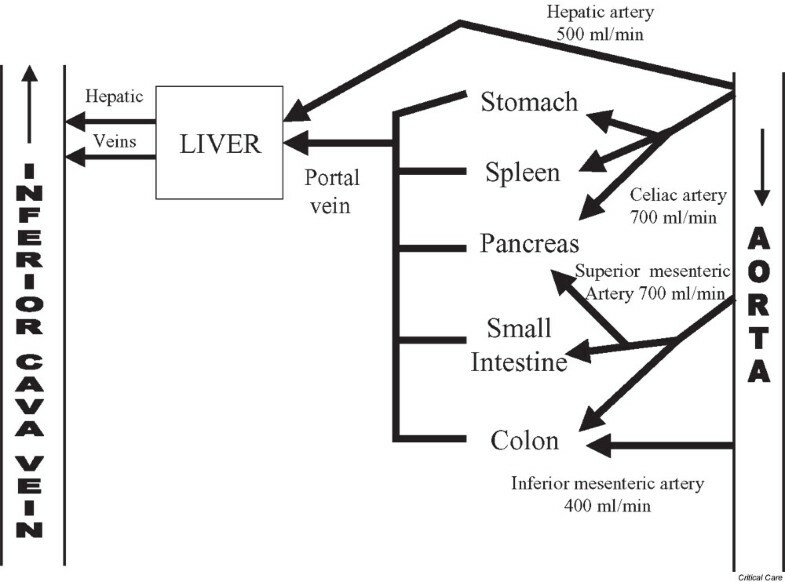 NA, not avalaible; HSBF, hepatosplanchnic blood flow determined by the indocyanin green (ICG) continuous infusion; LD, laser Doppler; MAP, mean arterial pressure; PCO2 gap, gastric mucosal–arterial gradient of PCO2; pHi, intramucosal pH; VO2, oxygen consumption. The infusion of low-dose dopamine (defined as a dose lower than 5 μg/kg per min administered to normotensive patients) may not improve gut mucosal perfusion. In fact, Nevière and coworkers  showed that low-dose dopamine decreased gut mucosal blood flow in septic patients. Furthermore, other investigators [27–30] reported that either pHi or PCO2 gap were unchanged in patients with sepsis treated with low-dose dopamine. The effects on liver blood flow may also be variable; Maynard and coworkers  observed that dopamine did not affect ICG clearance and monoethylglycinexylidide (MEGX) formation from lidocaine. Interestingly, the effects of dopamine on splanchnic blood flow may differ according to basal splanchnic perfusion. Low-dose dopamine increased splanchnic blood flow that was low at baseline (seven patients) but not when splanchnic perfusion was preserved (four patients) . The very small number of patients in each group limited these observations. Recently, Jakob and coworkers  reported that dopamine administration titrated to achieve a 25% increase in cardiac output induced a significant increase in splanchnic blood flow from 0.9 to 1.1 l/min per m2, which was associated with a significant reduction in splanchnic oxygen consumption. The results are even more controversial when dopamine is used at higher doses to restore blood pressure. Ruokonen and coworkers  observed that dopamine increased splanchnic blood flow and metabolism in some but not all patients with septic shock. In some patients, the same group of investigators  also observed an increase in hepatic vein oxygen saturation, suggesting an improvement in the balance between oxygen supply and demand during dopamine administration. However, in a pilot study, Marik and Mohedin  reported that dopamine administered at doses up to 25 μg/kg per min even decreased pHi. Given the very small number of patients included in these studies, no definite conclusions can be drawn regarding the effects of dopamine on splanchnic blood flow in septic patients. Comparison of the effects of norepinephrine and dopamine is difficult because norepinephrine is often combined with dobutamine, and study results are conflicting. Ruokonen and coworkers  reported unpredictable effects on splanchnic blood flow in patients with septic shock with norepinephrine, whereas dopamine induced a consistent increase in splanchnic blood flow. By contrast, in the randomized study reported by Marik and Mohedin , conducted in 20 septic patients with hyperdynamic septic shock, dopamine was reported to induce a decrease in pHi when compared with norepinephrine. More recently, De Backer and coworkers  reported the effects of dopamine, norepinephrine and epinephrine on the splanchnic circulation in moderate and in severe septic shock, and the main results are as follows. In moderate septic shock cardiac index was similar in dopamine-treated and norepinephrine-treated patients, and higher in epinephrine-treated patients, whereas splanchnic blood flow was the same with the three drugs. The gradient between mixed venous and hepatic venous oxygen saturation gradient was the lowest with dopamine, while PCO2 gaps were identical. In patients with moresevere septic shock cardiac index was greater and splanchnic blood flow lower with epinephrine than with dopamine and epinephrine; mixed venous and hepatic venous oxygen saturation gradient was greater with epinephrine, whereas PCO2 gap remained unaltered by any of the treatments. Given the available data (summarized in Table 1), no definite conclusions can be drawn regarding differences between dopamine and norepinephrine on splanchnic blood flow and metabolism in patients with septic shock. NA, not avalaible; HSBF, hepatosplanchnic blood flow determined by the indocyanin green (ICG) continuous infusion; MAP, mean arterial pressure; PCO2 gap, gastric mucosal–arterial gradient of PCO2; pHi, intramucosal pH; VO2, oxygen consumption. NA, not avalaible; HSBF, hepatosplanchnic blood flow determined by the indocyanin green (ICG) continuous infusion; LD, laser Doppler; MAP, mean arterial pressure; PCO2 gap, gastric mucosal–arterial gradient of PCO2; pHi, intramucosal pH. In patients with sepsis, a retrospective study conducted by Silverman and coworkers  identified a beneficial effect of dobutamine infusion on pHi . Two years later Gutierrez and coworkers  reported an increase in pHi with dobutamine infusion in patients with sepsis syndrome who initially had low pHi. This beneficial effect, confirmed in other studies [37–39], was not related to an increase in splanchnic blood flow induced by dobutamine [39, 40]. Creteur and colleagues  reported that dobutamine decreased the PCO2 gap in septic patients with a high gradient between the mixed venous and hepatic vein oxygen saturation (>20%), whereas PCO2 gap was not affected in patients when this gradient was less than 20%. This suggests that patients with the most severe alterations in hepatosplanchnic blood flow are also prone to decreased mucosal perfusion. Dobutamine usually, but not without exception, increases splanchnic perfusion [40–42]. The effects on splanchnic metabolism are more variable  and may depend on the adequacy of splanchnic perfusion at baseline. In patients with septic shock, De Backer and coworkers  reported that splanchnic oxygen consumption increased during dobutamine administration only in patients with an increased gradient between hepatic venous and mixed venous oxygen saturation. Combinations of dobutamine and other catecholamines have often been studied, in particular in association with norepinephrine for its effects on β-receptors, with the aim of modulating hepatosplanchnic haemodynamics. Indeed, in patients with sepsis, changing from norepinephrine (α-agonist and β-agonist) to phenylephrine (pure α-agonist), titrated to produce similar global haemodynamic measurements, led to a decrease in splanchnic blood flow, splanchnic oxygen delivery and gastric pHi. These changes were associated with decreased rates of liver lactate uptake and glucose production . Whether dobutamine has a specific effect on the splanchnic circulation is still debated. In a cross-over study conducted in eight patients with septic shock, Meier-Hellmann and coworkers  showed that epinephrine caused lower splanchnic flow and oxygen uptake, lower gastric pHi, and higher hepatic vein lactate concentration than did the combination of dobutamine and norepinephrine. Duranteau and coworkers  compared the effects of epinephrine, norepinephrine and the combination of norepinephrine and dobutamine in patients with septic shock on gastric mucosal flow, as assessed using a laser Doppler technique. Epinephrine and dobutamine–norepinephrine led to a significant increase in gastric mucosal flow as compared with norepinephrine alone, but these findings were not corroborated by those reported by Seguin and coworkers . Moreover, in patients with septic shock resistant to dopamine, the combination of norepinephrine and dobutamine, in comparison with epinephrine alone, restored gastric pHi more quickly and limited the increase in arterial lactate concentration. However, there was no difference in gastric mucosal PCO2 gradients between groups at 24 hours of treatment . The preferential effect of dobutamine on splanchnic blood flow was not confirmed by Reinelt and coworkers , who studied the effects of dobutamine on fractional splanchnic flow and hepatic glucose production in septic patients resuscitated adequately with fluid and norepinephrine. Their results showed a parallel increase in splanchnic blood flow and cardiac index, unaltered splanchnic oxygen consumption and decreased rate of endogenous production of hepatic glucose. These findings suggest that splanchnic blood flow is increased in well resuscitated septic patients, and that a dobutamine test is able to reveal a oxygen delivery/consumption dependency [41, 43] but it cannot exclude intraorgan blood flow redistribution at the microcirculatory level. The inadequacy of blood flow distribution is mirrored by the absence of correlation between splanchnic blood flow and the PCO2 gap. Reported data on the effects of dobutamine and norepinephrine on splanchnic haemodynamics are summarized in Tables 2 and 3, respectively. We suggest that both dopamine and norepinephrine can be given to septic shock patients as first-line catecholamine drugs but that their use must be weighed against the undesired neuroendocrine side effects of dopamine . Epinephrine should be reserved for use as rescue therapy. If norepinephrine is chosen as the first agent, then the addition of dobutamine may be considered. Dopexamine hydrochloride is a dopamine analogue with vasodilating effects that may be useful in improving splanchnic microcirculation in septic shock. Twenty-five ventilated patients with systemic inflammatory response syndrome were randomly assigned to receive either a 2-hour infusion of dopexamine (1 mg/kg per min) or of dopamine (2.5 μg/kg per min) after baseline measurements of gastric pHi, MEGX formation from lidocaine and ICG disappearance rate. Dopexamine had no effects on systemic measurements but it significantly increased pHi and ICG plasma disappearance, suggesting a selective increase in splanchnic blood flow and improved hepatic function, as indicated by increased MEGX concentration . A previous study from the same group showed that dopexamine at higher doses (4–6 μg/kg per min) raised gastric pHi together with a nonsignificant increase in ICG clearance . Temmesfeld-Wollbrück and coworkers  employed reflectance spectrophotometry for direct assessment of the microvascular haemoglobin saturation and haemoglobin concentration in the gastric mucosa in patients with septic shock. Compared with healthy control individuals, patients with septic shock exhibited a reduced microvascular haemoglobin saturation with a wide distribution and with tailing of the histogram to severely hypoxic values in spite of high whole body oxygen delivery. This microvascular disturbance was associated with reduced microvascular haemoglobin concentration and a lower gastric pHi. Short-term infusion of 2 μg/kg per min dopexamine in 10 patients with septic shock increased both microvascular haemoglobin saturation and concentration, whereas whole body oxygen uptake and gastric pHi remained unaltered. Other investigators did not confirm these beneficial effects. Hannemann and coworkers  reported the effect of incremental doses (0.5–4 μg/kg per min) dopexamine on splanchnic circulation in 12 patients with severe sepsis haemodynamically controlled with fluid challenge and dobutamine. Splanchnic blood flow increased proportionally to cardiac output but dopexamine lowered gastric pHi in a dose-dependent manner in all patients . Finally, in 12 septic shock patients haemodynamically controlled with norepinephrine, dopexamine titrated to increase cardiac output by 25%  increased median splanchnic blood flow whereas the fractional splanchnic blood flow was significantly reduced, and none of global or regional oxygen exchange or PCO2 was altered. In addition, those investigators found no influence of dopexamine on metabolic parameters either . Given these discrepancies, it is reasonable to recommend further investigations into dopexamine before it may be routinely used in septic shock. Physiologically, vasopressin (a nonapeptide that is released from the neurohypophysis) plays a minor role in blood pressure regulation. Clinical data revealed that the initially very high plasma concentrations of vasopressin decrease during prolonged sepsis . In the past few years clinical studies showed that blood pressure can be rapidly restored in septic shock using vasopressin, but this is mainly at the expense of cardiac output . Nevertheless, in 2000 the American Heart Association and International Liaison Committee on Resuscitation recommended (grade IIB) continuous vasopressin infusion in refractory septic shock . However, the effects of vasopressin on regional (i.e. splanchnic) blood flow are discussed controversially. In 1997, Landry and coworkers  reported on the continuous infusion of vasopressin (1.8–3.0 IU/hours) in five patients with septic shock. In all patients, blood pressure was rapidly restored and urine output increased in three. Patel and coworkers  randomly assigned 24 patients with septic shock to a double-blind 4-hour infusion of norepinephrine or vasopressin, and open-label vasopressors were titrated to maintain blood pressure. Although norepinephrine dosage could be significantly lowered in the vasopressin group, blood pressure and cardiac index were maintained in both groups. Urine output did not change in the norepinephrine group but increased substantially in the vasopressin group. Similarly, creatinine clearance did not change in the norepinephrine group but increased by 75% in the vasopressin group. Finally, gastric mucosal PCO2 gradient did not change significantly in either group. Recent results from Klinzing and coworkers , however, indicate that vasopressin may lead to a different blood flow distribution pattern in the splanchnic area as compared with norepinephrine. In 12 patients with septic shock, vasopressin was administered at a dose of 0.06–1.8 IU/min to replace norepinephrine completely. As a result, cardiac index and systemic oxygen uptake decreased significantly. Total splanchnic blood flow tended to decrease, while splanchnic blood flow expressed as percentage of cardiac output as well as the PCO2 gap were doubled . By contrast, the increase in gastric PCO2 gap suggests that blood flow may have been redistributed away from the mucosa, and therefore it does not appear beneficial to directly replace norepinephrine with vasopressin in septic shock. Clinical data also suggest that low-dose vasopressin (0.04 IU/min) to compensate for endogenous deficiency could be a beneficial strategy [57–60], as was recently demonstrated by Dünser and coworkers , who randomly assigned 48 patients with catecholamine-resistant vasodilatory shock to receive a combined infusion of vasopressin and norepinephrine or norepinephrine alone. Vasopressin-treated patients had significantly lower heart rate, norepinephrine requirement and incidence of new onset tachyarrhythmias. Mean arterial pressure, cardiac index and stroke volume were significantly greater, and the PCO2 gap was significantly lower in patients treated with this combination. However, these patients also presented with a significant increase in plasma bilirubin concentration, suggesting an impaired liver blood flow and/or a depressed hepatic function mediated by vasopressin. More recently, terlipressin (glycinpressin), a long-acting vasopressin analogue, was proposed as a treatment for septic shock. O'Brien and coworkers  reported their clinical experience with terlipressin (1–2 mg) as rescue treatment in eight patients with refractory septic shock. Those investigators reported a rapid and 24 hour lasting stabilization in blood pressure, with a significant reduction in norepinephrine but a significant decrease in cardiac index. In that study, seven patients required renal replacement therapy and four patients died during their stay in the ICU. However, optimism regarding these findings must be tempered somewhat , in particular because detrimental effects on splanchnic blood flow have been described. Auzinger and coworkers  studied seven patients with catecholamine-refractory septic shock and subsequent infusion of terlipressin using gastric tonometry. During the 24-hour intervention period, terlipressin was administered as an intermittent bolus (1–3 mg). Although no changes occurred in lactate levels, the PCO2 gap progressively increased over 72 hours. Both vasopressin and terlipressin are potent vasoconstrictors and both are able to restore blood pressure in vasodilatory or septic shock. However, the effects on splanchnic blood flow are not yet fully elucidated. Clearly, adequacy of volume resuscitation is a major prerequisite for maintenance of microcirculatory blood flow. The currently available data suggest that both substances administered to compensate for endogenous vasopressin deficiency may be beneficial. Although the armamentarium for treatment of septic shock is enriched by such substances, it remains unclear whether administration during septic shock decreases morbidity or improves survival, and further research is warranted. Modulation of the cytokine response by catecholamines might be a mechanism by which decreased morbidity and mortality are achieved with supranormal oxygen delivery in high-risk surgical patients . Phosphodiesterase III inhibitors have positive inotropic, vasodilating and anti-inflamatory properties, and they may avoid the development of tolerance to catecholamines as a result of β-receptor desensitization. In a prospective, double-blind study , 44 patients with septic shock and conventional resuscitation were randomly assigned to receive dobutamine or enoximone to maximize left ventricular stroke work index. At 12 and 48 hours after baseline measurements, liver blood flow was assessed with hepatic venous catheterization, liver function was derived from appearance in plasma of MEGX, and release of tumour necrosis factor-α was determined to assess the severity of ischaemia/reperfusion injuries. There was a similar increase in cardiac index, systemic oxygen delivery and consumption, and liver blood flow in the two groups. Fractional splanchnic blood flow decreased slightly but significantly in dobutamine-treated patients, whereas it remained unchanged in enoximone-treated patients. In the latter group liver oxygen consumption and MEGX kinetics were significantly higher at 12 hours but not at 48 hours. The release of hepatic tumour necrosis factor-α after 12 hours of dobutamine treatment was twice as high (P < 0.05) as during enoximone treatment, suggesting a faster anti-inflammatory effect of enoximone. These interesting findings on hepatosplanchnic effects of phosphodiesterase III inhibitors were not confirmed by other studies, and further investigations are needed if these agents are to be recommended for routine clinical use. Prostacyclin or its stable analogue iloprost are vasodilator substances with platelet aggregation inhibiting and cytoprotective properties. Administration of prostacyclin by the intravenous route was shown to increase oxygen delivery and consumption in septic patients  and to improve gastric pHi , as did aerosolized prostacyclin in patients with septic shock and pulmonary hypertension treated with epinephrine or norepinephrine . Finally, Lehmann and coworkers  reported restored plasma ICG clearance without harmful effect on systemic haemodynamics in patients with septic shock treated with iloprost. More recently Kiefer and colleagues  reported the hepatosplanchnic effects of iloprost in 11 patients with septic shock requiring norepinephrine. Iloprost was incrementally infused to increase cardiac index by 15%, which significantly increased splanchnic blood flow in parallel, without a major fall in mean arterial pressure. Iloprost induced a decrease in endogenous glucose production rate without change in the hepatic clearance of the glucose precursors alanine, pyruvate and lactate. Similarly, the PCO2 gap was not altered. The authors avoided mean arterial pressure drop by careful exclusion of hypovolaemia before inclusion, but still the increment in iloprost doses was limited by the decrease in arterial partial oxygen tension, which raises many questions in patients with acute respiratory distress syndrome. These interesting findings on hepatosplanchnic effects of such vasodilators need further investigation before these agents may be recommended for routine clinical use . Opening the microcirculation using a vasodilator is an alternative approach for treatment of the jeopardized microcirculation in patients with sepsis or septic shock. Data reported by Sprock and coworkers  suggest that the use of intravenous nitroglycerin results in improved sublingual microvascular flow, as assessed by orthogonal polarization spectral imaging. However, one cannot assume that the sublingual microcirculation necessarily behaves like the whole splanchnic microcirculation does. N-acetyl cysteine (NAC) administration was associated with a decrease in gastric pHi in septic patients [74, 75] and prevented the decrease in pHi in septic patients under hyperoxic stress . In a randomized, double-blind study conducted in septic shock patients, NAC given within the first 24 hours after admission to the ICU was shown to improve cardiac index and splanchnic blood flow and MEGX concentration, and to decrease gastric mucosal PCO2 gap, whereas it did not influence fractional splanchnic blood flow . Nevertheless, these positive effects of NAC on the splanchnic circulation must be balanced against several negative studies. Indeed, NAC was reported to depress cardiac performance in septic patients , and it even worsened mortality rate when it was given more than 24 hours after hospital admission . Is NAC a 'double edged sword'? This question should be answered before its use in daily practice can be recommended. Publications related to this topic are scarce. In 11 critically ill patients mechanically ventilated and treated with inotropic support, intermittent dialysis increased the PCO2 gap . In contrast, in two recent studies conducted in patients with acute renal failure  and septic shock , the PCO2 gap remained unaltered whereas cardiac index and stroke volume, as well as splanchnic blood flow, transiently decreased . Although improved cardiovascular stability during continuous veno-venous haemofiltration in comparison with intermittent dialysis has been demonstrated in retrospective studies , the superiority of continuous haemofiltration over hemodialysis on splanchnic circulation has not been proven . In this review we summarize different, and potentially opposing, approaches to management of splanchnic circulation in patients with septic shock. However, in these studies the measurements were focused on the effect of the drug on splanchnic blood flow or a surrogate such as the PCO2 gap, but none of these studies reported convincing results with respect to mortality and/or morbidity.